A: I joined the Enterprise team in 2007 through Enterprise Holdings’ acquisition of National and Alamo. 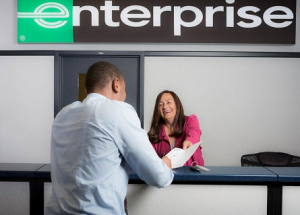 Altogether, I have worked for Enterprise and Alamo for the past 22 years. A: Our customer had just wrapped up a business trip in Huntsville and was about to board a flight home to Arkansas when he found himself at the gate without his wallet. He rushed back to our return area to comb through his rental car but came up empty handed. After bringing the matter to our attention, he recalled using his credit card at the gas station down the street. With only 45 minutes until his flight’s departure, I knew I had to act fast. I told him to hop in my vehicle and I quickly drove him back to the gas station. We looked everywhere. Then, just as we were about to give up, I asked him which direction he turned when he drove out of the station. We got lucky, because sure enough, his wallet was on the side of the road near the gas station’s entrance. It appears he had placed it on the trunk after paying and simply forgot to pick it up. With only minutes left on the clock, I dropped him off at the terminal and wished him luck with his departure flight. Q: What made you go out of your way to help? A: He was a customer in dire circumstances – helping is just what we do. I knew I could help save him time by escorting him back to the gas station and fortunately, we found his wallet just in time. A: I try to always go the extra mile. In this case, I’m glad I did because I learned in route to the gas station that he works at Walmart’s corporate office and travels often with Enterprise. In addition, he told me that just a few days prior, Walmart hosted Enterprise in Bentonville, Arkansas, where they shared Enterprise’s approach to customer service. Every customer has a story and this one happened to involve one of our company’s largest accounts, so I’m glad it all worked out. A: Be visible and available to customers. Had I not been working the return lanes that day, I might not have had the opportunity to help as quickly as I did. Q: What phrase describes your approach to customer service? A: Do for them what you would like done for you.